Arkon's mobile phone car mounts and cell phone mounting brackets are high quality supports for your iPhone, cell phone, or mobile phone. All of the solutions below feature Arkon's Gripmatic cradle that featuers side grip arms and a push button release mechanism. The only difference is the pedestal that is used in the solution. Arkon offers the widest selection of mounting options. The top sellers include the windshield suction mount, cup holder mount, air-vent mount, and the flexible steel gooseneck mount. There's even a mounting solution for your bicycle. Choose from the selection below. 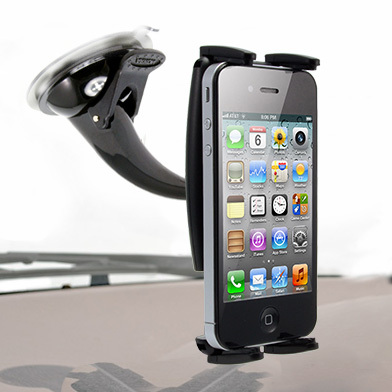 car mounts and holders compatible with many mobile phones and smartphones. dashboard mounts, removable air vent mounts, cup holder mounts, and more. The Mega Grip holder is designed to securely hold larger “Super Phones” such as the Samsung Galaxy S, Motorola Droid 2, Motorola Droid X, HTC EVO 4G, HTC Droid Incredible, Apple iPhone, and more. For use with Vehicle Specific Mounts (VSM) offered by other manufacturers such as ProClip, Brodit, ProFit, and Panavise. Arkon's AP016 allows you to convert the 4 Hole AMPS pattern found on the Magellan RoadMate 700 and 800 series to Arkon's Dual T Connector pattern.